Free Shipping Included! 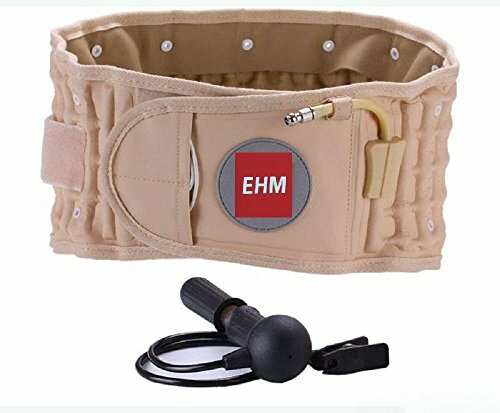 Decompression back Belt Pain Lumbar support by EHM Small, medium , Large by EHM at Moment Info. MPN: EHMBB. Hurry! Limited time offer. Offer valid only while supplies last. EHM decompression belt provides clinical grade traction and decompression therapy. When it is inflated, it increases in height by 4 inches (7.5cm). EHM decompression belt provides clinical grade traction and decompression therapy. When it is inflated, it increases in height by 4 inches (7.5cm). It helps lift your upper body and unloading the weight off the lower back and allowing the muscles to relax. The decompression belts helps relieve pressure off pinched nerves. It permits herniated and bulging discs to return to their normal position and condition. It can be used in both upper and low back pain treatment. The treatment is endorsed by the medical professionals. Features: CE approved. The decompression belt is a revolutionary new product. The decompression treatment don't not need any surgery and drugs. The belt inflates with air and it is very light. It is convenient. You can use it at anytime and any where. It expands vertically, gently stretching the lower back. This gentle traction helps decompress the spinal discs and tight muscles. The expandable columns provide a secure support to the lumbar vertebrae. It is suitable for all ages and all sizes. With the physio decompression belt, there is no pills, no appointments, just less pain and less bills. Benefits: Strengthen back and core. Stretch tight lower back muscles. Relieve lower back pain and stiffness. Improve nutrient flow on your spine. The belt transfers the weight off your spine. Lift upper body weight off lower back. Reduce pain and pressure on pinched nerves. Decompress lower back joints and spinal discs. Stabilize lower back and improve posture. Decompress the spine allowing for discs to return to normal. Help relieve pressure off pinched nerves.